Since our wedding in late September, Montana and I had faced a variety of obstacles that made our first couple months as a married couple extremely challenging. October is my busiest time at work, while Montana was just starting a demanding new job, so we wouldn’t go on a honeymoon until February. I broke my foot right before the wedding, and then Sandy turned off our electricity for a week. Amid all that, we lost a cherished member of our family. It was a tough way to start a marriage, and we’d barely spent any time together that didn’t include huddling together for warmth in a pitch-black apartment. We needed to get away and reconnect in the worst way. My wife knew I loved Las Vegas and had long wanted to take her there. 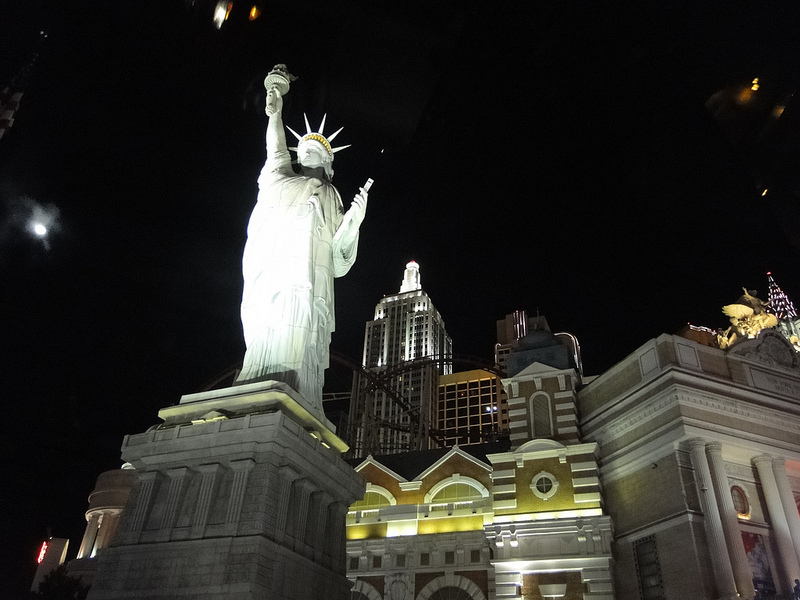 And since Vegas is the escapism capital of the universe, it seemed a perfect destination to escape for what she had taken to calling a Mini-moon. My first trip to Las Vegas for New Year’s in 2002 was a revelation. Captivated by the city’s energy and its relaxed attitude toward public drinking, I actually had little desire to return home to drab, chilly New Jersey. I had this notion that perhaps I could somehow find a job at some Sin City sports radio station, talking boxing, betting lines and UNLV basketball. It should be no surprise that like many of my age-23 flights of fancy, this one never got off the ground. Five years later, obsessed at the time with running, I decided to try a marathon through the desert. I ran next to a large group of men and women in Elvis suits, gamely sipped a beer at Mile 23 and finished 20 minutes faster than my previous best time. No longer really a drinker and holding down a job in sports back home, I used the experience as a benchmark to measure how far I had come. I wanted this third trip to recapture the magic and possibilty of those first two, especially since Montana had never ventured west of Cleveland. I wanted to walk down the Strip with her, eat nice dinners, go to a couple of shows and watch the water show at the Bellagio. And though I realize this was a fairly ridiculous reason to want to fly across the country, high on my list was paying a visit to Hostel director Eli Roth’s new all-year haunted house, the Goretorium. My wife was amenable to this, provided we also hit the Mandalay Bay Aquarium and take in a couple of Cirque Du Soleil shows, a perfectly reasonable if not inexpensive request. 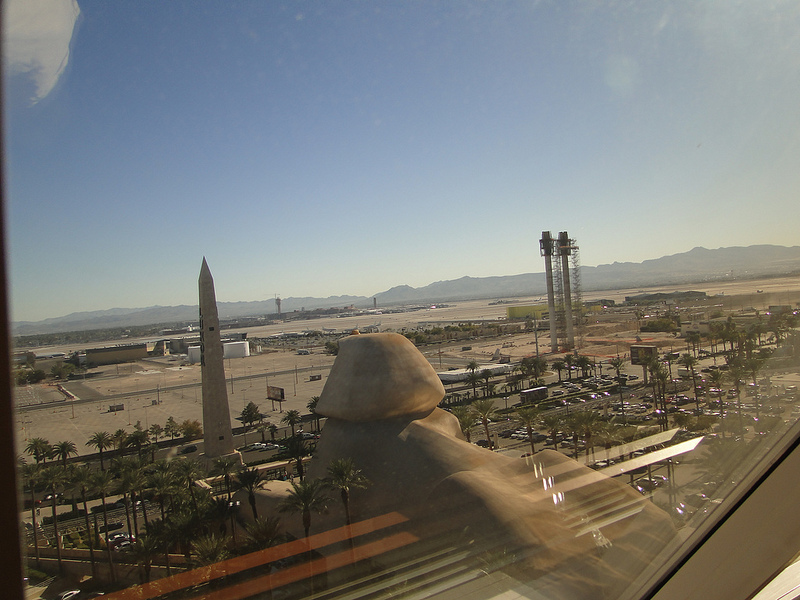 Just like five years ago for the marathon, I booked a room at the Luxor in the giant pyramid recently made infamous by Frank Ocean. Once we arrived, citing our newlywed status, we puppy-dog faced the woman behind the desk until she upgraded us to a massive suite with a hot tub right by the window overlooking the Strip. Our mistake was not spending more time in that tub. 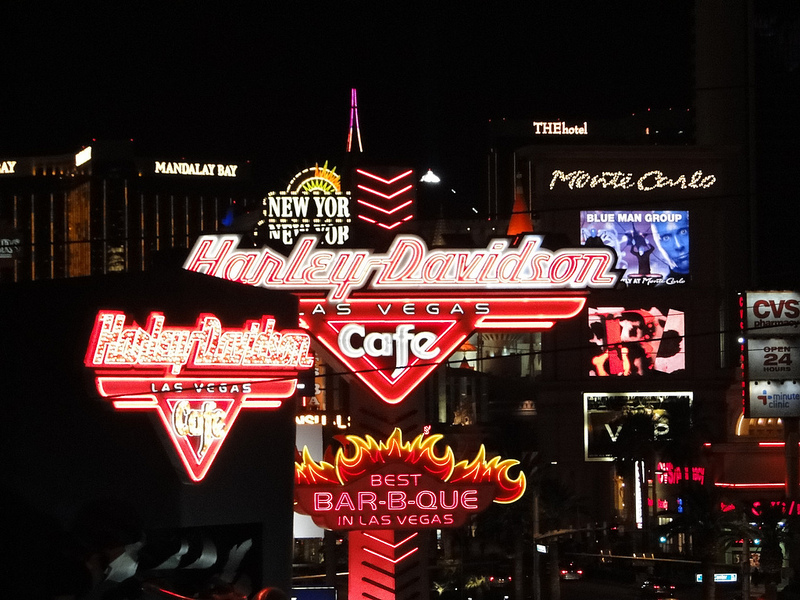 Badly in need of relaxation, we still couldn’t resist Las Vegas compelling us to overprogram ourselves. Jet-lagged but eager to explore, I immediately dragged us out of the pyramid and all over the city. After years of build-up, I damn near ruined Vegas’ mystique on my wife’s first day there by pushing us way past the point of diminishing returns. We returned to the Luxor on Thanksgiving night exhausted, ravenous and miserable. We rebounded nicely on Day 2. This isn’t to say we still didn’t jam a hell of a lot into Black Friday; we went to the aquarium, a terrific CSI exhibit and — of course — the Goretorium. I also found time to place risk-averse wagers on a dozen sporting events, coming out a whopping 10 dollars ahead. By the time we settled into our seats for Cirque Du Soleil: O at 10 p.m. Vegas time, we were both perilously close to falling asleep, which we both did at various points despite acrobats risking death on trapezes 100 feet above a wading pool. If one had fallen to his death, I’m assuming we’d have woken up. The city itself was pretty much as I remembered it: garish by design, with all its fake skyscrapers, moon-eyed tourists, medieval castles, enormous pirate ships and dudes handing out advertisements for prostitutes. The prices on everything had gone up, as is likely to happen in any city after five years had passed. But I couldn’t help noticing that Las Vegas seemed somewhat shabbier than it had when I was 23, and even when I was 28. The lousy economy has taken its toll, and there just seemed an undertone of desperation, if not depression. And perhaps my priorities have changed as well. Relatively few of the things that entertained me a decade ago still do; I no longer listen to Korn, I don’t watch movies with Adam Sandler and you couldn’t pay me to eat at a Taco Bell. My idea of a perfect night is a quiet dinner at home with my wife, then watching boxing on the couch with a glass of wine. That’s why our vacation to Cozumel worked: We were able to fully relax and spend time together without people harassing us to purchase half-price tickets to this or that. Las Vegas is still great for what it is. It’s just, I feel like as I get older and my tastes evolve, I’m less interested in the things it’s great for. In a stunning upset, my wife’s favorite part of Las Vegas ended up being none other than the Goretorium. She said it was legitimately like being in a horror movie; I concurred that it was the finest haunted house I’d ever been to — well-acted, masterfully decorated and actually possessing a decent storyline. My favorite thing about the Goretorium, though, was that Montana genuinely liked it. She’s generally game for doing things she wouldn’t normally go for that she knows will make me happy, but it made me feel good that she actually seemed to enjoy herself, even if she required an enormous (and appropriate) bloody mary after we made it through. When the Goretorium tweeted her a few days later to offer its services to renew our vows at some point, she didn’t immediately rule it out, which speaks volumes. 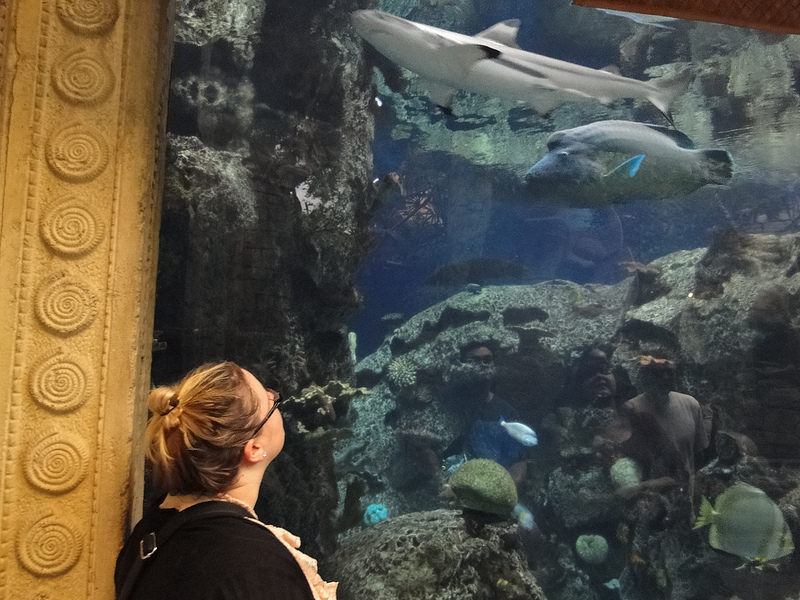 Just as surprising was that in a Gift of the Magi-esque twist, my favorite part of our trip turned out to be the aquarium. I like sharks as much as the next guy. But more than that, I enjoyed simply spending time strolling with my wife, snickering at weird-looking fish, touching rubbery giant rays, reading about how jellyfish have no brain. It was fun, and more importantly, it was the one time I felt like we were simply free to enjoy each other’s company. In a city where everything is a bit too loud, too bright and costs a bit too much, it made perfect sense that somewhere between the piranhas and sawfish, we found us.